Sabratah – In the aftermath of weeks of conflict in the Libyan coastal city of Sabratah, at least 4,000 migrants, previously held in numerous informal detention centres and camps, have been transferred to a hangar in the city’s Dahman area, where IOM, the UN Migration Agency is providing emergency assistance. Sabratah is approximately 80 kilometres west of Tripoli and is one of the main departure points for migrant boats attempting to make the perilous journey across the Mediterranean Sea to Europe. On 7 October, a day after the first transfer of migrants, IOM sent a field team to the hangar to assess the situation. 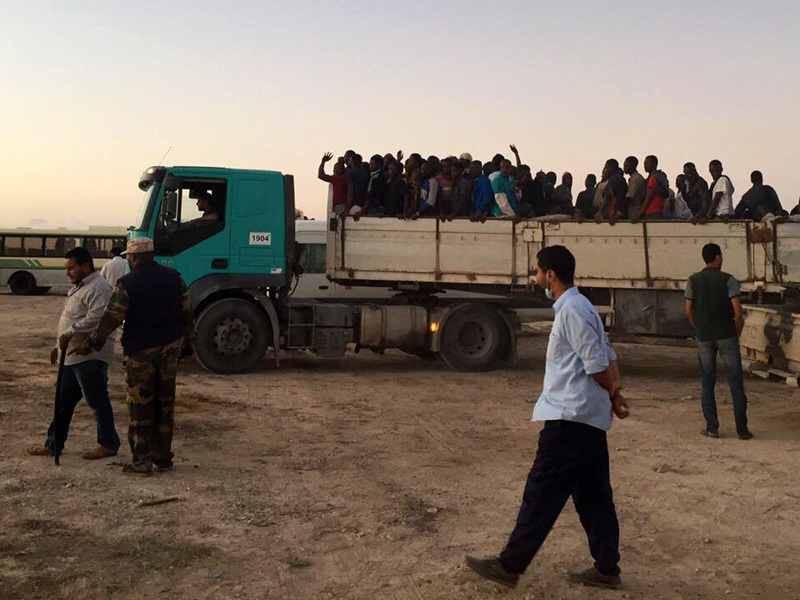 By the end of the day, the team reported that 2,600 migrants (1,819 men, 704 women and 77 children) were being kept at the site by the Libyan Directorate for Combatting Illegal Migration (DCIM). More migrants from other locations in Sabratah were later transferred to the hangar and more are anticipated to arrive soon. The migrants are from almost a dozen countries and among them are pregnant women, newborn babies and unaccompanied children. IOM medical team assessed the migrants’ primary health needs and in one case one pregnant woman was transferred by ambulance to a private clinic, 10 kilometres from Sabratah, where she gave birth to a healthy baby boy. IOM provided food, water and core relief packages, which include mattresses, blankets, pillows and hygiene kits to the initial 2,600 migrants. More food and emergency assistance will be provided in the coming days for all migrants in the hangar. IOM is also providing psychosocial support over the next few days. The migrants will also be offered the opportunity to return home through IOM’s Voluntary Humanitarian Return Assistance Programme. The Libyan authorities have reported that the migrants in the Sabratah hangar will be transferred to detention centres in Tripoli. Already, about 2,000 migrants are in the process of being transferred by DCIM and IOM is already present at these centres to continue assistance as they arrive. As more migrants are moved through the hangar, which has almost no facilities, there is an urgent need for basic assistance, including food, water, core relief items and medical assistance. “We will continue to monitor the situation closely in consultation with humanitarian partners on the ground. IOM calls for a unified and coordinated response by all humanitarian actors to meet the needs of these migrants,” said Belbeisi. IOM is providing food, water and core relief packages, which include mattresses (pictured above), blankets, pillows and hygiene kits to over 4,000 migrants in Sabratah, Libya.